The Love your Os campaign was a comprehensive 6-month long, multi-disciplinary campaign to raise awareness of oxygen, clean air, lung health, and the importance of not smoking as a key part of being active and fit. The Love Your Os Campaign was initiated in the 2012-13 school year in collaboration with, and exclusively at, Woodman Park Elementary School in Dover, NH. The goal of the Love Your Os Campaign is to reduce the use of tobacco or marijuana and raise awareness of how smoking harms a kid’s body and prevents it from getting oxygen to muscles during exercise. Youth to Youth ultimately hopes to reduce the rate of smoking by youth and increase their lung health and athletic capacity as well. This initiative focuses on the immediate consequence of diminished athletic capacity from smoking tobacco (or marijuana) by promoting awareness – in a positive way – of the importance of the Os (oxygen molecules) all around us. Positive reinforcement of what healthy lungs can do for us when they are clear and clean to do their job of providing us with Os. 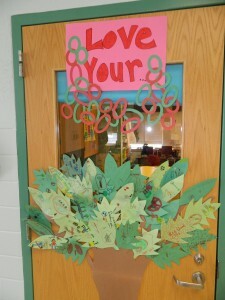 Decorate Your Door Contest: Every teacher in the school was invited to have their class decorate their classroom door or a wall outside the door with a Love Your Os message. Many teachers took their classes on a tour of the doors and walls and discussed how different classes got the message across. A winning class from each grade was selected and all of the students from those classes got “Athlete’s Love Os” T-shirts. Samantha Skunk Loves Her Os Assembly: Dover Youth to Youth presented this 30 minute presentation to the entire 2nd grade. In the story Samantha tries smoking and can’t keep up with her friends when they play because she can’t get enough Os to help her muscles. Os Games in Gym Class: The Physical Education Teacher was the in-school Os coordinator. 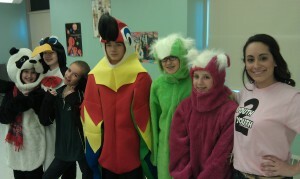 He developed a series of love your Os games played during gym class that reinforced the Os message. Love Your Os Art Contest: All of the 4th graders were challenged to create a piece of artwork that promoted the Love Your Os message. 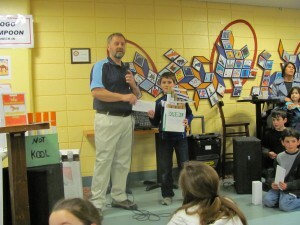 Winning students in each class received gift cards. Every participant received an “Athletes Love Os” sports bottle. Promote fitness and awareness of the importance of physical activity. Develop an age appropriate appreciation of the: oxygen > lung > blood > muscles process and the basic biology involved. Raise awareness of the importance of clean air, the role of trees and plants in providing Os, and other related environmental issues.